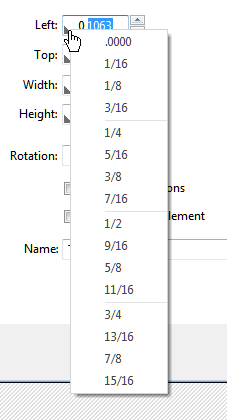 When sizes are expressed in inches, as defined in the Option form under the Appearance tab, it is possible to modify the fractional part of each size through a context menu that displays 16 inch fractions. By clicking the right side of each text box, the popup menu will be displayed, allowing selection on 1 out of 16 incremental fractions. By selecting one of these menu items, the fractional part of the size expressed in the text box will be modified to the decimal value matching the selected 16th fraction.